TRAP DESCRIPTION: 20" Wide x 18" Tall x 30" Long. 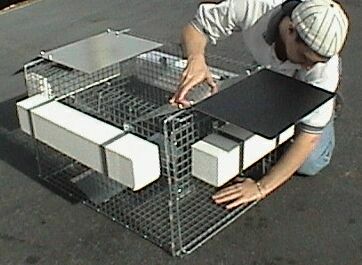 Live Trap for turtles which is a true multiple catch design. Turtles enter through one way doors when the trap is used on land. This trap can catch several turtles at once. T he door will easily open and close behind them once they are inside. Turtles are motivated to enter the trap when it is baited with something the turtles are eating which might be found locally. This could be a type of plant, fruit, vegetable or fish. 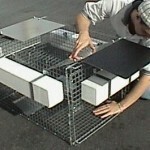 Turtles will try to access the trap by walking around it pushing on the sides of the trap as they go. The sides which have the doors will give in and push open so they will readily crawl inside. But what makes this trap special is that it's also built to float. Featuring two entry ramps, this trap works by presenting itself as a comfortable place on which to rest. Unsuspecting turtles will climb up either ramp to get to what they believe is a stable platform where they can rest in the sun. However, once on the top side of the "trigger platform", the hinged flippers will drop down and cause the turtle to fall down into the holding area of the trap. There they will remain caught and contained. Though they cannot escape, trapped turtles will be kept alive for relocation. WHERE TO USE IT: Either along shore line on land, just in shallow water or as a true floating trap completely in the water. Try sets with entrance doors pointed into the water as well as parallel to the shore. Whichever set catches turtles faster should then be used all the time. Shallow water ditches, which have no more than 2-4 inches of water, also make good places to make a set.